Blackberry and black raspberry are two different fruits. A person who is not that exposed to berries will surely have a hard time distinguishing one from the other; but you can never blame them because it is really hard to tell which is which by simply looking at the fruit itself. It may be because both fruits belong to the same genus ‘Rubus’ and the same family ‘Rosaceae’ that they are often confused with one another. This is also why these two fruits are called ‘brambles.’ Bramble fruits are characterized by the clustering of smaller fruits (druplets) to become one bigger clump of fruit. The most obvious key difference between the two is the stem. When you pick up the black raspberry from the plant, you will notice that it has become hollow. In other words, its stem (more appropriately termed as receptacle) was pulled out from the fruit and remained with the plant. This is not the case with blackberries because when you harvest them, you will almost always retain its stem. Secondly, it is said that black raspberries can be harvested earlier compared to blackberries. It will usually take several weeks more to harvest blackberries after you are already done harvesting your black raspberries. Thirdly, blackberries are said to be more sensitive to cold. In this regard, these fruits cannot endure temperatures of 10 degrees or less. 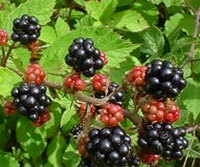 It is best to protect blackberries from the freezing temperatures of the winter season. If you are keen enough to pay attention to details, you will really see some differences on how the black raspberry looks like. This fruit is actually relatively smaller and its skin does not have much shine as compared to blackberries. It is perhaps due to the presence of some hairs on the druplet fruits that makes it look that way. On the other hand, the blackberry fruit is smoother and is generally hairless. Blackberries are also the original bramble fruits from the Northern and Southern parts of America, as well as, in Asia and Europe while raspberries are native treats in Northern America alone. Lastly, in terms of commercial value black raspberries are way behind blackberries. Because of such, many raspberry growers convert them into ornaments, decorations or garden plants. 1. Black raspberries become hollow in the middle when picked from the main plant whereas the blackberries retain its stem. 2. Black raspberries are harvested at an earlier time while blackberries are more sensitive to cold temperatures. 3. In terms of looks, blackberries are said to be smoother and shinier than black raspberries. 4. Blackberries are native fruits in North and South America, as well as, in some parts of Asia and Europe whereas black raspberries are only indigenous in North America. 5. Black raspberries have less commercial value than blackberries. Julita. "Difference Between Blackberry and Black Raspberry." DifferenceBetween.net. June 14, 2011 < http://www.differencebetween.net/object/comparisons-of-food-items/difference-between-blackberry-and-black-raspberry/ >.